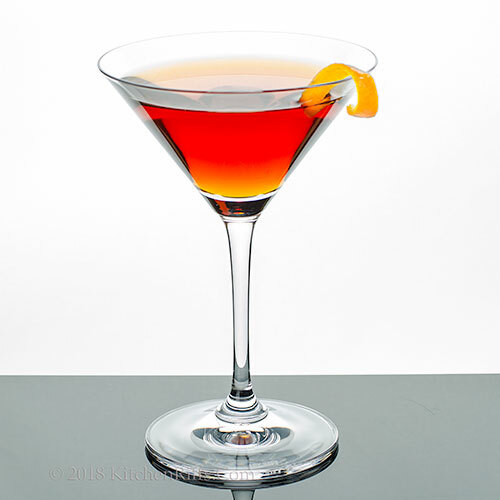 The Toronto Cocktail is a hearty mix of Canadian whiskey, Fernet-Branca, simple syrup, and bitters. 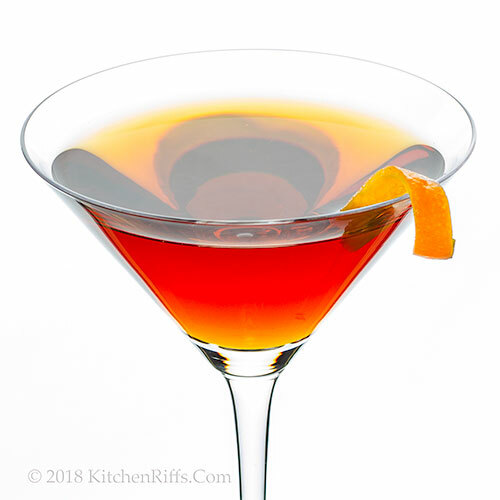 The addition of Fernet-Branca (a bitter herbal liqueur from Italy) gives this drink some zip, as red vermouth does in a Manhattan. But the bitterness is tempered by sweetness, so it also reminds us of an Old-Fashioned. In fact, we think of it as a cross between those two drinks. This drink traditionally is made with Canadian whiskey, which contains rye. But Canadian whiskey tends to be lighter and smoother than American-made rye whiskey. That’s because it often contains a high percentage of neutral grain spirits, which contribute to the alcoholic quotient of the whiskey but don’t add much flavor. Most of the Canadian whiskeys sold in the US are rye-neutral blends. But you can find unblended Canadian rye whiskey as well, and that’s our preference for this drink. More about that in the Notes. Place all ingredients (except garnish) in a mixing glass half-filled with ice. Stir briskly until the ingredients are well combined and chilled – about 30 seconds. Strain into a cocktail glass, preferably one that’s been chilled. Garnish, if desired, and serve. This drink is typically served “up” in a cocktail glass. But you could also serve it over ice in a rocks (Old-Fashioned) glass. Why stir rather than shake? Because the ingredients in this cocktail are clear. Shaking would cloud the drink (by introducing oxygen bubbles). The bubbles dissipate pretty quickly, though, so shake away if that’s your preference. We often do. Rye is an important component of Canadian whiskey. In fact, many people use “rye” and “Canadian” whiskey as basically synonymous terms. But why does Canadian whiskey so often include neutral grain spirits in the mix? The reason dates back to the Prohibition era. When whiskey ceased being produced in the US during the Prohibition years, bootleggers turned to Canada for supplies. But whiskey can take a while to produce (good-quality whiskey is aged – typically at least 3 or 4 years, and often considerably longer). Canadian distillers couldn’t increase production fast enough to meet the demand. So they started blending neutral grain spirits into aged whiskey to increase volume. This kept the alcoholic quotient high, but somewhat diluted the flavor. The Toronto Cocktail tastes best when made with whiskey that has a high rye quotient. We used a Canadian Club 100% rye. A US rye, like Rittenhouse Bottled-in-Bond, would also work. Fernet-Branca is a bitter herbal liqueur (i.e., an amaro). Some people like to consume it neat as a digestif (or even as a morning-after pick-me-up). We find the taste of Fernet-Branca a bit too strong by itself. But it’s wonderful in cocktails. BTW, we’ve seen recipes for the Toronto Cocktail that substitute brandy for rye. We like brandy, but much prefer whiskey in this drink. I love whiskey! I've never heard of this cocktail but it sounds right up my alley--I'll be trying this one for sure! Hi Kelsie, this is a good drink! Not nearly as well known as it should be. Thanks for the comment. Hi Evelyne, we'll take any and all opportunities to celebrate Thanksgiving! :-) Thanks for the comment. We have a TON of family up in Canada so this is great! I just happened to pick up some rye whiskey yesterday... this cocktail looks and sounds amazing. I love a good reason to celebrate, hooray for Canadian Thanksgiving and thanks for reminding us! Hi Pam, Fernet-Branca has become kinda trendy among some mixologists. We really like it, but to us it's best used in small quantities, and mixed with other spirits. Thanks for the comment. Hi Ashley, you'll have to serve this the next time you all get together! Thanks for the comment. Hi Pam, rye is wonderful, isn't it? Our favorite whiskey! Thanks for the comment. Hi Dahn, yup, we all love a reason to celebrate! :-) Thanks for the comment. This sounds very pleasant tasting. I'm not much of a drinker but I think I'd like this. Perfect for fall! HI Vicki, the flavor of this really does suit fall. And winter. :-) Thanks for the comment. Hi Carolyn, Toronto is a wonderful city! I haven't spent much time there -- maybe 3 weeks all told -- but it's terrific. As is this cocktail. :-) Thanks for the comment. We go fishing in Canada every year for walleye. My husband especially loves it there. He thinks we should take it over, This drink will just convince him further! Hi Sherry, well, maybe a sheet and a half. :-) Thanks for the comment. Hi Rosemary, Canada is a wonderful country, isn't it? As is this drink! Thanks for the comment. I have never heard of this cocktail..sounds fascinating and as always, gorgeous shots, John. Hi Angie, alas, this cocktail isn't that well known. But it should be! :-) Thanks for the comment. Hi Tricia, the simple syrup really balances the drink -- makes it extremely sippable. :-) Thanks for the comment. John, another new one on me! And it's so pretty. Good tip about stirring instead of shaking--I hadn't thought about that. And I had no idea what made Canadian whiskey different from any other. Hi Jean, we often shake when we're supposed to stir -- just because. :-) Thanks for the comment. Hi Greg, you'll love this! As will your friend. :-) Thanks for the comment. I've always thought the Canadian way of having longer time span between Thanksgiving and Christmas was more civilized. We Americans crunch all the holidays together, it can be a frenzy. I think I'll have a Toronto to ponder a bit more about the holiday season. Hi Deb, we should all have a Toronto and ponder this. :-) Thanks for the comment. A very festive looking cocktail. I had no idea Canadian Thanksgiving was celebrated in October until a few days ago. If you celebrate it, Happy Thanksgiving! Hi MJ, good thing we have loads of other cocktails to tempt you. :-) Thanks for he comment. Hi Denise, we celebrate every chance we can get! :-) Thanks for the comment. Hi Jeff, Toronto is a terrific city -- I think you need an excuse to visit again. :-) Thanks for the comment. Having visited Toronto many times through the years, I don't know how I missed this one. Sounds like a great cocktail. Having worked for a Canadian company for many years, I can totally agree with you regarding Canada being the best neighbor. Hi Ron, Toronto is terrific! We love it. And this drink, of course. :-) Thanks for the comment. I keep telling my husband that I want to celebrate Canadian Thanksgiving this weekend. He looks at me like I am nuts, but I am so serious! Even if we buy everything pre-made, LOL! I wanttttt my Thanksgiving 2x this year! Hi GiGi, you should! Thanksgiving is our favorite holiday by far, so why not celebrate twice? :-) Thanks for the comment. Love your and Mrs. K.R.’s conversation this week! And the cocktail is lovely - jewel toned! And that is the only time someone has ever explained why stirred vs. shaken! Hi David, this drink is gorgeous when you shine a light through it -- one of the prettiest ones we know. Tasty, too, which is the important thing! Thanks for the comment. I've never been to Canada (GASP!) or had this cocktail. In fact, I haven't heard of it, so thank you once again for the mixology lesson. :-) The photographs are stunning. Hi Valentina, you owe it to yourself to visit Canada! Wonderful place. As is this drink. :-) Thanks for the comment. John, we just had a wild turkey run through or back yard. This must be some kind of sign. This cocktail is stunning. We are having about 25 close friends over for festivities, would you like to come and bring your drink recipe. Hi Bobbie, I'd LOVE to come! Can't make it, alas, but that sounds like loads of fun. :-) Thanks for the comment. Another gorgeous cocktail! Sounds perfect on a cool fall evening....though it's rather summerish tonight! Hi Liz, it's been summerish here, too. Really want cooler weather -- so I can enjoy one of these. :-) Thanks for the comment. I'm not sure about the addition of Fernet-Branca, it is a taste that takes some getting used to. Happy Thanksgiving to all our Canadian friends out there. 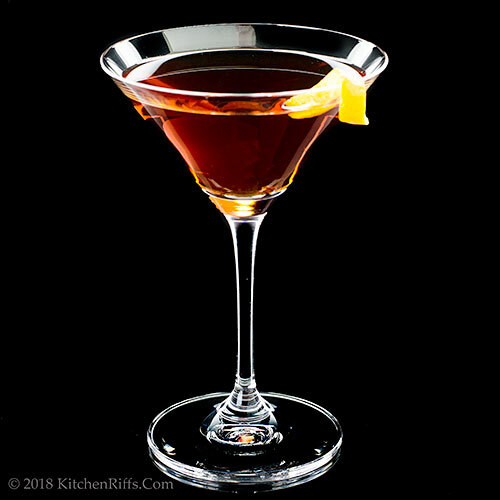 Hi Karen, we don't much like fernet-branca by itself, but it really works in small quanties in cocktails, Particularly this one, :-) Thanks for the comment. Wow, I actually saw Christmas decorations for sale in July. Good grief. I love the idea of celebrating with our neighbors to the north! Hi Debra, the more Thanksgivings the better. :-) Thanks for the comment. There is something to be said about no Christmas decorations! And no Black Friday! But regardless...it sounds like this drink would be perfect anytime! Hi Abbe, this would be good anytime! No special occasion required. :-) Thanks for the comment. I remember having Canadian whisky and ginger beer once in Toronto and considering I am not whisky fan I didn't find it to bad. So I could be tempted to give this one a go. Hi Emma, I really like ginger beer, so that sounds like a drink I need to try! :-) Thanks for the comment. This has such a great rusty colour, sounds delicious too! Hi Caroline, it IS delicious! :-) Thanks for the comment. This makes me want to start celebrating Canadian Thanksgiving! 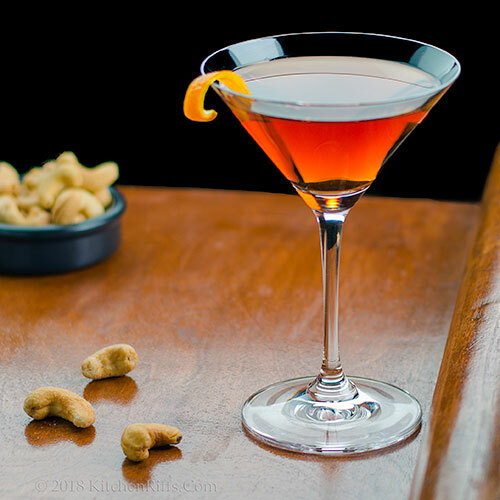 What an elegant, and tasty cocktail. Hi Lisa, it's fun to celebrate two Thanksgivings. :-) Thanks for the comment. IT is so interesting as I slowly but surely start to develop a taste for whiskey cocktails...so this is something that I would love to try...over ice though...thanks for the recipe John...have a wonderful week! Hi Juliana, if you're just getting into whiskey, over ice is probably the best way to go. And this drink is quite nice when served that way! Thanks for the comment. I loved my trip to Toronto and I know I would love this cocktail. I think I will make it to remember the fun I had. Also, I love herbal liqueurs and am very excited to try Fernet. Hi Laura, Toronto is such a neat city! As is this drink. :-) Thanks for the comment.